Rather than give away too much plot details, how about a few pointers as to what’s going on in the busy pages of this manic missive? Aphra’s current lover is a high ranking Imperial woman called Inspector Tolvan, who against her better judgement, cannot resist the charms of the narcissistic, selfish Doc. She’s here, all conflicted and that, as to whether she can pull rank and get Aphra out. 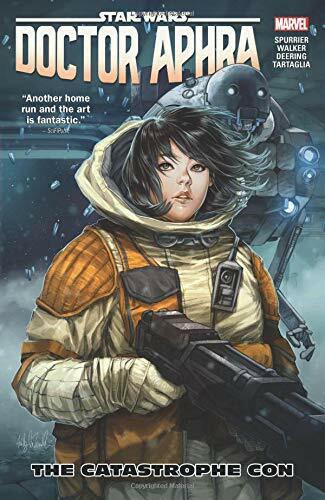 In flies Sana Starros, Aphra’s ex, on a mission from the Rebel Alliance to also extract the incarcerated Doc. Awkward or what? Everyone’s favourite tin pot terrors 0-0-0 and BT-1 aren’t far behind showcasing some delightful Freddy Kreuger-esque customised finger slashers and an arsenal of blasters. Like a darker version of 3P0 and R2 who prefer torture and destruction to chatting to Cloud City computers and moisture evaporators. Let’s not forget that Aphra is still being pursued by Tam Posla a righteous bounty hunter who strikes a Boba Fett gone Boys Scout cord, for the death of his beloved partner. Yep, he’s on his way too. So, it’s all kicking off on this flying heap of a junked up detention facility and well, as if that’s not enough, it might just be haunted! Yep, there’s a ghostly apparition who may or may not be someone from the Doc’s past … or it may be something completely different.